These days we have photos and even videos to remember loved ones, but in the past, people had different ways of dealing with grief. Those who were wealthy enough would commission pieces of jewelry to help them with the grieving process. These pieces were called “memento mori” jewelry. The name comes from the Latin phrase and translates as “remember that you will die.” As such, this jewelry was not necessarily a way to remember a lost loved one, but as a way for people to remind themselves that life was fleeting. This kind of jewelry would boast depictions of coffins, skeletons, worms, and snakes – all to remind the wearer of death and decomposition. 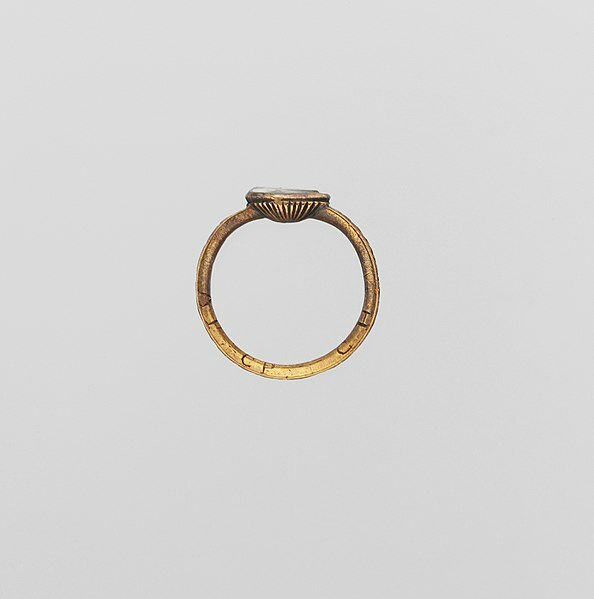 Gold was used for the structure of the ring, pendant, or brooch, while black enamel would be utilized for the detail, which could also include semi-precious stones and other colors of enamel. Given the strong belief in the afterlife, such jewelry could also have been away for mourners to feel comfort in the fact that they were certain to meet their loved ones in the next world. 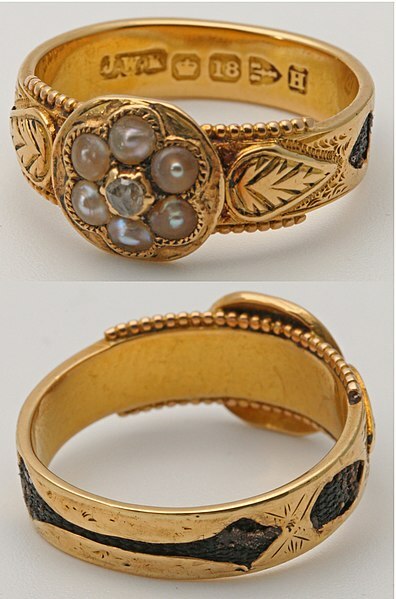 Lenore Daily is a dealer in mourning jewelry based in Michigan. In a piece for the National Jeweller in 2014, she described how jewelry to remember a loved one became popular after the death of King Charles I of England. 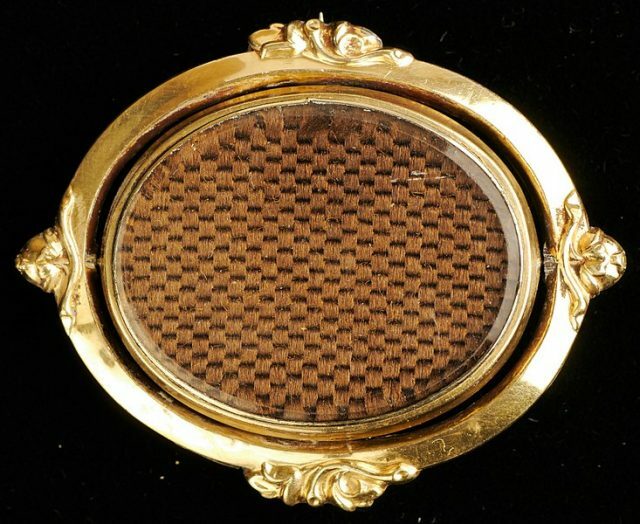 His execution in 1649 brought about a change in the purpose of mourning jewelry. Dailey theorizes that many nobles who had supported Charles wanted to show their sympathy for his death. As such, they commissioned jewellers to make rings with a picture of the king or a suitable inscription. Thus the trend for rings and other items that would remind the wearer of the inevitability of death was slowly superseded by the desire to wear jewelry that commemorated an individual. By the Georgian era, mourning jewelry was becoming more personal and detailed, often with inscriptions to remind the owner of the lost loved one. There were a lot of allegories involved. Pictures often showed urns, willows, weeping figures, wreaths, angels, and cherubs – all symbols that are often associated with death. They could also show crosses for Christian symbolism or anchors to show steadfastness. 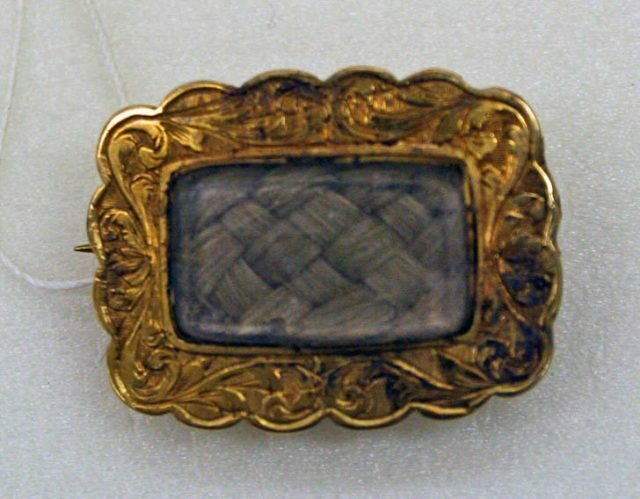 Victorian mourning jewelry featuring woven hair. 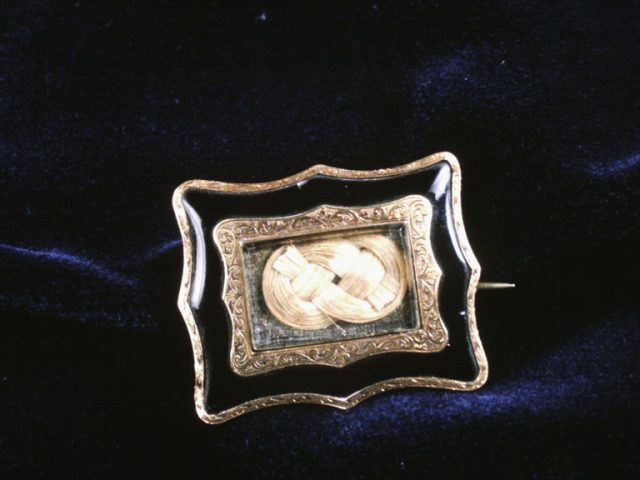 Lock of hair in a brooch. 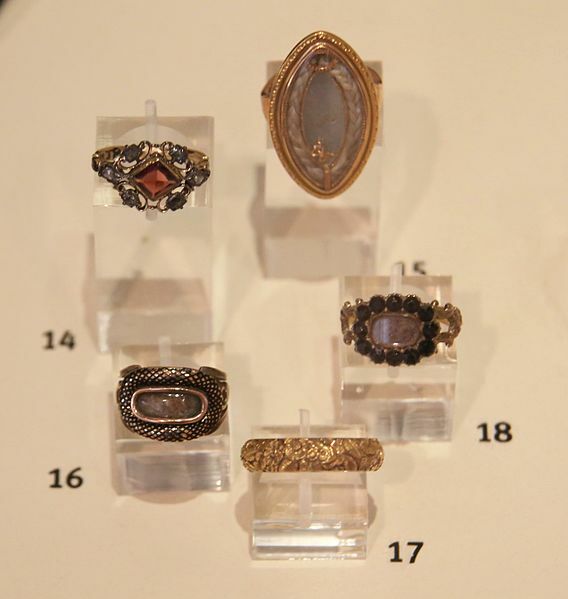 However, these rings, brooches, and pendants often went a step further by containing a lock of the loved one’s hair. The hair might be the central focus of the piece of jewelry, or it might be artfully incorporated into a grander scene. For example, there is a locket on display in the Victoria and Albert Museum with a watercolor painting as the background, a miniature urn made of metal and decorated with seed pearls, and a lock of the deceased’s hair set to look like a frond or tree curling over the urn. As an extra, personal touch, the deceased’s initials of “FW” have been put on the plinth of the urn. 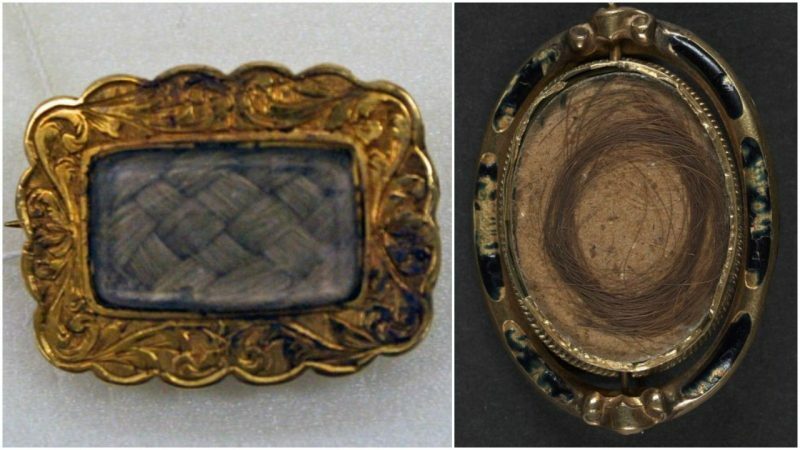 According to Pamela Wiggins who wrote an article on mourning jewelry for The Spruce Crafts in August this year, hair could also be ground up and mixed with water to create a dark liquid that was used, like ink, to write the inscriptions on the jewelry or to paint a somber scene. 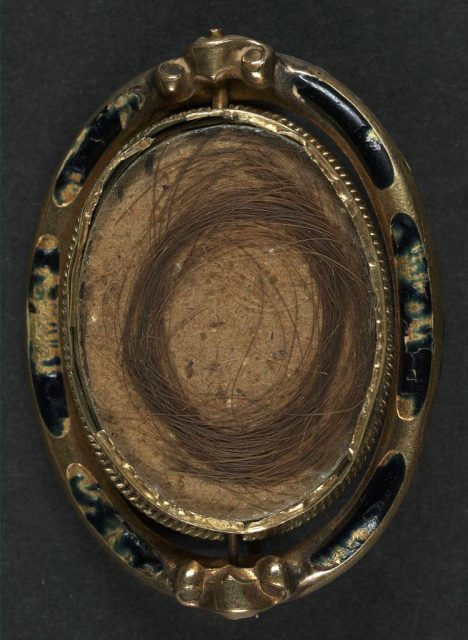 Previously, memento mori and mourning jewelry had been made to order, but in the Victorian era, methods of mass production meant that anyone could buy a pre-made locket to which they could add a lock of hair or an inscription. 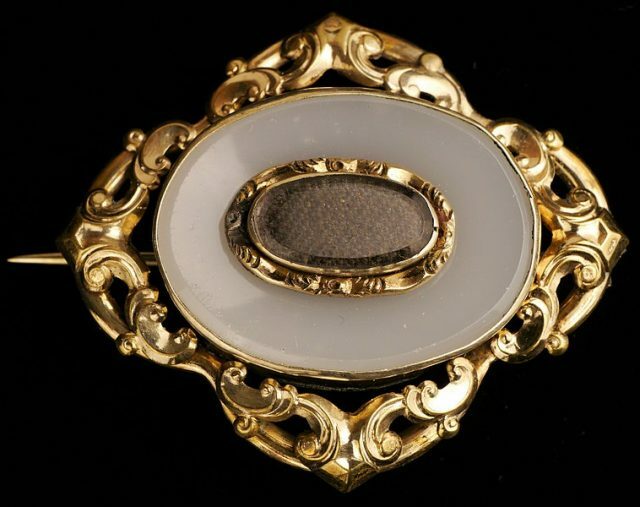 Another significant difference was that whereas memento mori jewelry could incorporate colors other than black, the Victorians really took the darkest shades to heart when mourning their loved ones. Their jewelry was generally black, with white or grey for variation. As such, the mineral jet was in very high demand. Not only can it be polished up to a sleek, shiny black, but it’s also quite easy to carve. Black onyx and tortoiseshell were also highly valued. Many pieces of mourning jewelry survive today, and can often be quite valuable, even after the loved one they commemorated is long forgotten.